Tamil star Suriya is all set to enthrall his fans with the back-to-back releases of NGK and Kaappaan. While NGK is hitting screens in May, Kaappaan was speculated to be releasing on August 15, as an Independence Day treat. Recently, Mohanlal, who’s essaying a crucial role in Kaappaan, gave a video interview to a Malayalam TV channel to promote his upcoming film, Lucifer. During the interview, Suriya pleasantly surprised everyone by calling Mohanlal. 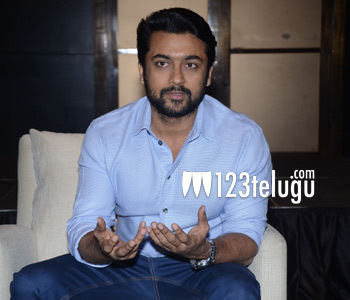 Suriya also confirmed that Kaappaan will indeed be released on August 15. In Kaappaan, Suriya plays an NSG Commando. Mohanlal is reportedly playing a union minister. Suriya’s Veedokkade and Brothers director KV Anand is directing Kaappaan. Akhil’s heroine Sayyeshaa is the leading lady in the film, which also has her husband Aarya in a key role. Lyca Productions banner is bankrolling this highly-anticipated action drama.